In March, we announced that all of the Google Web APIs adopted support for OAuth 2.0. It is the recommended authorization mechanism when using Google Web APIs. Today, we are announcing the OAuth 2.0 Playground, which simplifies experimentation with the OAuth 2.0 protocol and APIs that use the protocol. Trying out some requests in the OAuth 2.0 playground can help you understand how the protocol functions and make life easier when the time comes to use OAuth in your own code. With the OAuth 2.0 Playground, you can walk through each step of the OAuth 2.0 flow for server-side web applications: authorizing API scopes (screen shot above), exchanging authorization tokens (screen shot below), refreshing access tokens, and sending authorized requests to API endpoints. At each step, the Playground displays the full HTTP requests and responses. 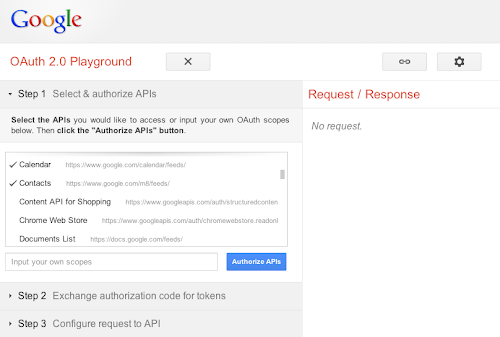 The OAuth Playground can also use custom OAuth endpoints in order to test non-Google APIs that support OAuth 2.0 draft 10. You can click the link button to generate a link to a specific Playground state. This allows quick access to replay specific requests at a later time. Please feel free to try the OAuth 2.0 Playground. We are happy to receive any feedback, bugs, or questions in the OAuth Playground forum. Very cool tool - I got it working with the salesforce.com OAuth 2.0 implementation earlier this week - see my blog post over there. Is it correct that the playground sends a blank scope parameter after the first step? Some of the API's that I use require this field to have a value.